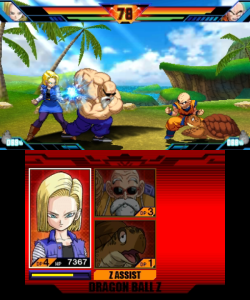 After truckloads of iterations of Dragon Ball Z games, another one appears exclusively for the Nintendo 3DS. What makes this one quite interesting is the fact that the genre went back to its roots by making a 2D fighting game, with tag team mechanics. We were curious to see how Goku faired in his transition from modern to retro but we also hoped to see some original content, which is something many of the previous games lack, as you’re always plowing through the same incoherent storyline (which in a way is understandable as the anime is around 500 episodes), next to a flimsy made up plot in order to offer a bit more than the events that occur in the anime. Unsurprisingly we are once again treated to the original story of the anime, that starts off from when the Saiyans first come to earth, trying to gain contact with Goku, as he was originally sent down to Earth as a child, to take over the planet. The good-natured Goku of course forgot all about his quest and lives a peaceful life as the protector of Earth. The story hits off when his long forgotten brother comes to the planet to wreak havoc. After this portion all the story arcs are told in a few phrases, with a battle in-between, providing hardly any information for those who are not yet familiar with the franchise, or simply haven’t watched the anime or read the manga. Nonetheless, a fighting game such as this one does not necessarily need a thick plot to be decent. Other than the original story, the creators tried to insert some new content with ‘another’ new story, that situates itself after the anime. Due to an extra power at work, all of Goku’s enemies that he has ever defeated are alive once again to exact their revenge. While Goku is more powerful than ever, and he could defeat them separately, seeing they are all together, it will become hard not to succumb to their reign of terror. All story portions of the game are brought by small visual novel-like cutscenes, with a few text windows, often not even properly showing what is actually going on. Whilst the limited animations are done properly, it would have been nice to get a little more action, rather than motionless faces. Appearance wise the game grabs back to the days of yore, with a pixilated style, albeit a very detailed one. Every character is portrayed in a detailed fashion, every move is fluent and there are enough fighters, as well as supporting characters to choose from. The backgrounds have a more 3D visual appearance but you can’t interact with it. Story portions are presented with still pictures and text windows, which is enough for the overall presentation of the story but less is not always more. It would have been nice to see a few scenes from the anime or other moving cutscenes implemented. 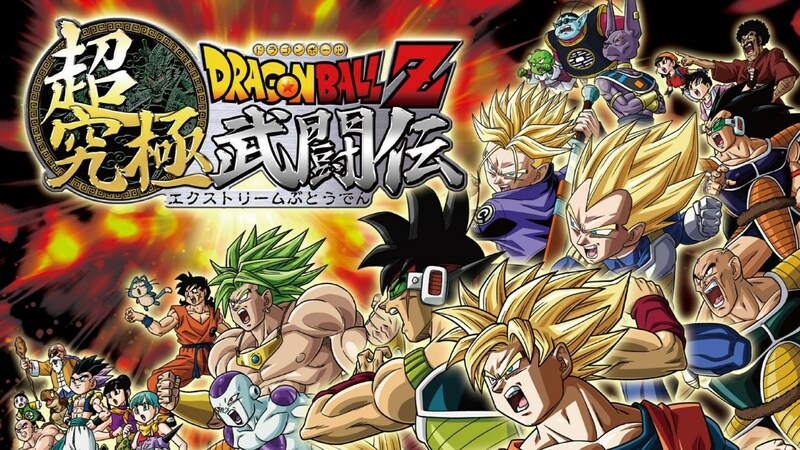 Upbeat battle themes are mixed with the original Japanese voice cast, creating a very authentic Dragon Ball Z experience. This portion of the game is well taken care of, especially the voice acting adds another layer to the experience. It’s only sad that the English cast was not implemented, because many have grown up with the English voices. Even though these voices were not always that consistent, it would have been a very nice touch. 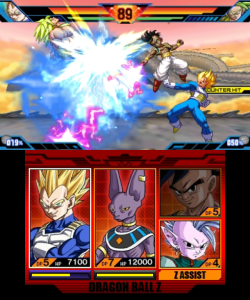 Dragon Ball Z: Extreme Butoden is a fighting game, with tag team mechanics to ensure hectic and action packed battles, albeit with simplified controls and skills. All in all, this game might resemble a portable Marvel vs. Capcom, yet with a less flashy appeal to it. Nonetheless, it’s all about fighting, however you look at the game. 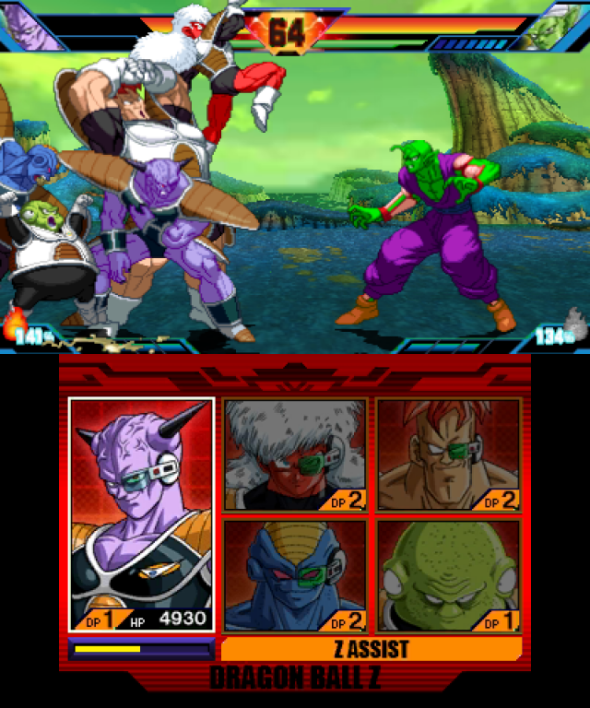 You’ll be able to choose several different modes such as the story, adventure, extreme world tournament, battle and versus and a ‘guild card’ function that doesn’t truly do that much. 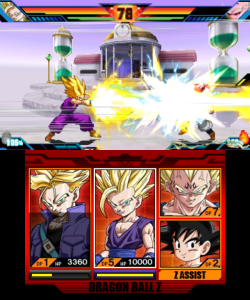 You’ll have to start off playing the story mode, if you wish to unlock adventure or the extreme world tournament. The other modes are already available from the start. While all modes are pretty much the same, you’ll be able to unlock supporting characters when completing challenges in the adventure mode. It was only sad to see that the game does not support Download Play, forcing players to each buy their own copy of the game. Normally you’ll be able to choose three different fighters, or two fighters and two support characters or one fighter and four support characters, when doing normal battles. In the story mode you’ll only be able to play with one character, as all the different branches of the story mode revolve around specific hero characters. During combat you’ll be able to switch fighters or summon support characters by tapping the touch screen. In battle it’s a simple matter of linking different sets of punches and charging up your KI in order to perform stronger attacks. To be honest, this game feels a bit more like a button basher, instead of a very tactical fighting game. This might also be because both characters always stay relatively close to one another, making sure action is always nearby. Those who wish to brush up on some things they forgot about Dragon Ball Z will have some fun browsing through the gallery in the extras but in the end it’s only a simple gimmick. You can also register a team setup here, making you load your favorite combination rather than always having to compose it over and over again. 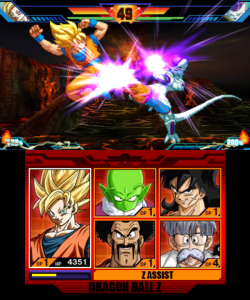 Dragon Ball Z: Extreme Butoden is a fun, simple fighting game, especially with the rather low difficulty settings. Nonetheless, even when playing solo, this game proves to have enjoyable tag team mechanics, even though it tends to feel like a button basher. There is a bit of content to unlock motivating you to play through the adventure mode, which makes it a tad more appealing. This game will never truly wow you, but it’s certainly worth it if you’re looking for a simple brawler.